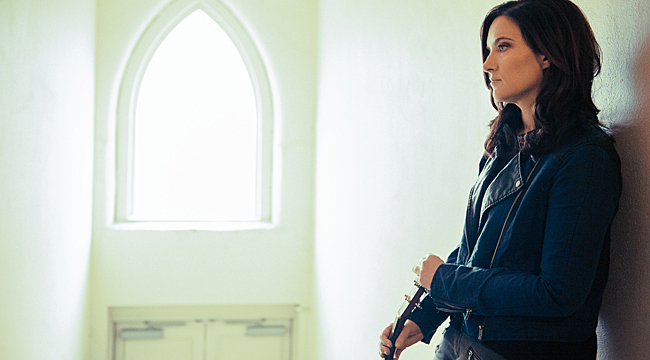 No longer just a behind-the-scenes songwriter, Brandy Clark is starting to get much-deserved recognition as an artist. “Hold My Hand,” a song from Clark’s debut, 12 Stories, was just nominated for a Grammy. She won the CMA Song of the Year Award last year for “Follow Your Arrow,” which she also co-wrote with Shane McAnally and Kacey Musgraves, and was named the 2014 Music Row Breakthrough Artist of the Year. Starting in January, she’s hitting the road with Jennifer Nettles. We spoke to her via phone from her Nashville home. You’ve had a great 2015. Talk about the year you’ve had. It has been a great year. I’ve been working on a musical—Moonshine: That Hee Haw Musical. I worked with Shane McAnally and we wrote some music for it. It opened in Dallas this summer. We’ve been working on that for a couple of years and for that to open has been great. Being out on road with Jennifer is really amazing. I was out with Alan Jackson before that. The thing I’m most excited about is that I made another record. I spent the month of June working with Jay Joyce on this record and I’m pretty proud of it. Being out with Jennifer, I’m getting to play this record live right now. How different was the recording process for this album? It was a much more intense process. The first time, we were working on a shoestring. We were using studio time when the producer didn’t have a project in there that was paying money. We worked every day from three or four in the afternoon to midnight. I was working on it on for four to six months. With Jay, we did have the luxury of a budget so we did it in a month. That was all I did. I enjoyed both processes. There were pros and cons to both things. With Jay, he’s a mad scientist. There was a point in the process where he asked me to give him about nine days by himself. That was a little bit scary for me. On my first record, I was there for every note. To hand it over to someone and let him tinker with it was scary. When I came back in and heard what he had done, it was mind-blowing. Can you talk about what it was like to grow up in Morton, Washington? It was a small town, right? Oh yeah, and that’s the theme of this record. It has a small town theme. Having grown up in one, it means a lot to me. I loved it. I can’t imagine a different way to grow up. Everyone knows everyone. You won’t get into huge trouble without someone’s parents telling yours. People in small towns look out for each other. They really care about each other. Another amazing thing is that I played several sports. Had I been in a big city, I might have played one. But if you’re in a small town and you go out for one sport, they need you for all of them. At my high school, the boys on the JV basketball team would be in the pep band. They run off the court and shower and then you see them playing trumpet when the varsity team comes out. You get to experience a lot of things. That sounds crazy. Most people would say you have more opportunity in a big town and you really do. We didn’t even have a theater department. We had a school play just once a year. I don’t think I could go and live in small town America at this stage in my life but I think small-town America is where it’s at. For growing up, I can’t imagine anything better. I think you initially performed in school musicals. What was that experience like? When I was a really young kid, I was in a community theater production of The Music Man. I was in a high school play. I don’t remember what the play was anymore. I was in art class. And I was an athlete. I did a little bit of everything. You studied commercial music at Belmont. Did you initially think you’d work more on the business side of music? I was trying to learn the business for myself. Honestly, I was a music business major because I was denied into the School of Music twice. It was my fallback. I thought I would do the music business degrees and if it didn’t work at least I would have that degree. Talk about writing “Mama’s Broken Heart” with frequent collaborators Shane McAnally and Kacey Musgraves. What brought the three of you together? That was an idea that Shane had had for a long time. It was “ain’t your mama something.” I loved that idea. I remember when he said it, I didn’t want him to write it with anyone else. I got what he was talking about. Then, Kacey came in one day and Shane started talking about his sister. His sister was going through this breakup and his mom she should handle it one way but he thought she should handle it another way. I said, “Maybe that’s the ‘ain’t your mama something.’” We talked about “your mama’s broken heart.” I remember the first response was that “broken heart” was too plain. But that’s what we came to. We wrote that song in a day and it felt like it was good. Kacey went home and did a Garage Band take with some handclaps that made it something really special. How did it find its way to Miranda Lambert? Somebody played it for her. She really wanted it and at the time Kacey was going to do it on her first record. Kacey said if she could sing background vocals she would let it go, if I remember right. Miranda wanted it from the first time she heard it. The thing that strikes me about your debut is the range of material. Some songs are funny and others are rather sad. Some are about getting high and some are about illegitimate children and divorce. How did you go about choosing which songs end up on the album? The first time Dave and I sat down, I said I had two loose concepts: either the day in the life of one woman or the length of a relationship. If it were the length of a relationship, we’d start the record with “Illegitimate Children” and end it with “The Day She Got Divorced.” That was my thinking. We didn’t do either of those things but that helped shape the song selection. The same thing applies to this next record. We went in with a concept. Jay was quick to say he didn’t want it to be too “on the nose.” It helps make the songs feel like they should be on the same record. “Crazy Women” is so hilarious. What inspired it? Yes. I love that you would ask that. I was watching a Lifetime movie about that Texas cheerleader scandal/murder. In the movie, Beau Bridges gets in Swoosie Kurtz’s face. He’s like, “You are crazy, woman.” She says, “Crazy women are made by crazy men.” It struck me right then. She said it just like it is in the song. That just hit me. Things that are said in movies or I read in books often spark songs. I don’t deliberately try to be but I guess I kind of am with all these songs. I love the female point of view and a story told from a woman’s point of view. I love all that. Women are interesting to me. I think it’s a lucky time for us in music. Women can tackle issues that men couldn’t. “Stripes” is a great example. A man could never sing about even thinking about shooting his wife. A woman can get away with that and tell a story that way. I feel pretty lucky to be a woman from that angle. But with the popularity of Bro Country, do men dominate country? I feel like there’s a shift happening. Maybe it will take some time, but I feel like we’re hearing more female voices than we’ve heard in the last couple of years on terrestrial radio. There are always women making records. At some point, there was just Carrie and Miranda but I feel that shifting. There’s Kelsea Nicole Ballerini and there’s Cam . . . her song is top ten, I think. I think that’s a signal of more female voices to come. Do you think we’ll see more mixed bills? Yes. Miranda Lambert is on the Kenny Chesney tour next year. The biggest way we have to be heard is terrestrial radio. As we hear more women on the radio, I think that will shift.